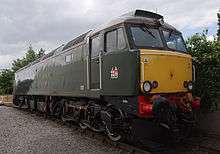 The Class 57 is a re-engineered locomotive, rebuilt by Brush Traction, Loughborough from redundant Class 47 locomotives. The locomotives are fitted with a refurbished EMD engine and a re-conditioned alternator, improving reliability and performance. Three variants exist, one for freight and two for passenger operations. Each cost £300,000, about one-third that of a new build locomotive. The class has its origins in 1997 when Freightliner ordered an initial six locomotives. In 2001, a prototype locomotive was converted with electric train heating, with a view to obtaining orders from passenger companies. Direct Rail Services currently operate nine class 57/0s, comprising 57002-57003 and 57007-57012 leased from Porterbrook and 57004 purchased outright as an insurance replacement for 37515 in 2008. DRS took 57302, 57305 and 57309 from Porterbrook in April 2012 on a three-year lease. Since December 2012, Direct Rail Services have provided haulage for Virgin Trains. As part of the deal another three class 57/3s were leased. In July 2014, DRS took over the leases of the remaining six class 57/3s from Network Rail. The 57's are used on the Rail Head Treatment Train (RHTT) during the autumn periods. DRS hires out some of The non Thunderbird 57/3's to Great Western Railway to cover when the Class 57/6 break down. 57307 Lady Penelope kept her nameplate after been handed to DRS in 2013 as 57307 was a favorite with the head of DRS. 57307 was out shopped in "Cable Thieves: We're Watching You" vinyls. In 2015 to mark the 20th anniversary of DRS 57307 was chosen to carry the anniversary livery. She was vinyled at Carlisle Kingsmoor DRS depot during the Open day to mark 20 years of the company. The five can be seen at different places on the West Coast Main Line, such as Rugby, Crewe, London Euston or Preston. In 2000, Porterbrook placed an order for a prototype passenger locomotive fitted with electric train heating. This locomotive, 57601, was leased to First Great Western in June 2001, FGW were looking for a replacement for its elderly Class 47 locomotives. It hauled Mark 2 stock on day services from London Paddington to Plymouth and Penzance until these ceased in September 2002 and the Night Riviera sleeper service. After an evaluation period, FGW agreed to lease three production Class 57/6s from Porterbrook in May 2002. with the first delivered in November 2003. As the prototype locomotive was non-standard, it was decided to order a fourth Class 57/6 in 2003 and return 57601 to Porterbrook. This occurred in December 2003 after the first production Class 57/6 was delivered with 57601 sold to West Coast Railway Company. Great Western Railway also plan to obtain one more Class 57, however the sub-class and number are not yet confirmed. The FGW fleet were originally painted green with a gold bodyside band to match the Night Riviera stock with cast name and numberplates. All four locomotives were named after castles in Devon and Cornwall, and operate mainly on the Night Riviera sleeper service with the occasional stock move. From March 2008 the fleet started to receive FGW's blue livery, with 57605 the first repainted. In June 2010 57604 received a repaint into lined Brunswick green livery to commemorate the 175th anniversary of the Great Western Railway. First GBRf hired Class 57/3s from Virgin Trains to operate in top and tail formation with Mark 2 stock on a FGW Taunton to Cardiff diagram from December 2009 until July 2010 when the Class 57/3s were replaced due to unreliability by Class 67s. In April 2003 57601 was sold to West Coast Railway Company but remained in traffic with First Great Western for a few months. WCRC managing director said that the first thing he did when he took control of the loco was to pass it though his paint shop to apply the house colours in the original diesel style. In January 2011, WCRC purchased 57001 from Freightliner from Porterbrook and 57005 from Advenza Freight, followed in April 2011 by 57006 from Advenza, with 57001 and 57006 returned to service and 57005 stored at Carnforth. In January 2013 57313-316 were purchased from Porterbrook, making West Coast Railway Company the only company to operate all three class 57 sub-classes. These have since had their Dellner couplings removed. Advenza Freight purchased 57005 and 57006 from Porterbrook in January 2008 to use on a number of freight flows won by the company. After Advenza ceased in 2009, 57005 was sold to West Coast Railway Company in January 2011, as was 57006 in April 2011. From January until July 2006, Arriva Trains Wales hired Class 57/3s from Virgin Trains to operate a weekday Manchester Piccadilly to Holyhead diagram with Mark 2 carriages. In December 2008, Arriva Trains Wales began operation of the daily Premier Service between Holyhead and Cardiff with Mark 2 carriages. To provide the motive power for this train ATW contracted Virgin Trains to provide Class 57/3 locomotives initially in top and tail formation, but later on their own. Four were repainted at Cardiff Canton, 57314 and 57315 receiving ATW livery, 57313 and 57316 plain blue with no signwriting. In March 2012 Class 67s took over the duties from the Class 57/3s. 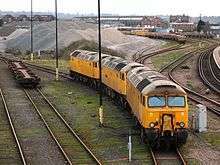 From the start of 2007 until 31 October 2009 Colas Rail hired Class 57/3 locos from Virgin Trains. Starting in August 2009, a Class 57/0 was hired from Direct Rail Services on a trial basis for one or two days each week. Unlike the Virgin Trains Class 57/3s, all sixteen of which were variously used on the timber trains, Direct Rail Services specifically allocated 57002 to the Colas workings with 57008 as standby when 57002 was undergoing maintenance. To reflect this allocation 57002 was fitted with a large Colas Rail logo on each side, just behind the non-driving side of each cab. 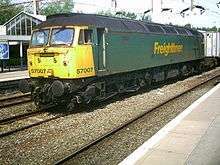 In 1997 Freightliner placed an order for an initial six Class 57/0 locomotives. The first of these was released in July 1998, and coincided with the unveiling of the new British Racing Green Freightliner livery. After an evaluation period Freightliner was sufficiently impressed to order a further six in June 1999, with plans for an eventual fleet of twenty-five. However, in the event no more were rebuilt, with Freightliner switching to new-built Class 66s. All were leased from Porterbrook. The Freightliner fleet saw use over a wide area, serving locations such as Ipswich, Southampton, Birmingham, Cardiff and Leeds. The introduction of the class resulted in the replacement of the Class 47 locomotives on most long-distance intermodal trains. Freightliner named all its locomotives, with examples such as Freightliner Pioneer and Freightliner Phoenix. In 2007, Freightliner started to replace its Class 57/0s with new Class 66 locomotives. Initially six Class 57/0s (the second batch) were returned to Porterbrook, and leased to Direct Rail Services in July 2007. Of the original six, three also went to Direct Rail Services and two to Advenza Freight in January 2008. The remaining Class 57/0 was sold to West Coast Railway Company in January 2011. In September 2011, Network Rail leased six Class 57/3s from Porterbrook for use on test trains and the new Network Rail snow train. The Dellner couplings were reconfigured to operate with 171, 350, 375, 376, 377, 444 and 450s in an emergency, due to their operational area primarily being the Southern Region. In July 2014, the leases were transferred to Direct Rail Services. To provide a fleet of locomotives for rescue duties and for drags on routes with no overhead wires, Virgin Trains signed a deal with Porterbrook in 2002 to rebuild twelve Class 47's as Class 57/3's with the first delivered in June 2002. After it was announced by the Strategic Rail Authority in June 2003 that Class 390 Pendolinos would operate along the North Wales Coast Line to Holyhead hauled by Class 57/3s, a further four were ordered. It was decided to fit the fleet with Dellner retractable couplings with the original twelve being retrofitted from October 2003. The Dellner coupling allows easier connection to Class 390 Pendolinos in regular service, and also Class 221 Super Voyagers in case of failure or emergency. From spring 2005, Class 57/3s were used to haul two daily Virgin services from Crewe to Holyhead, complementing the Class 221 Super Voyagers that covered the other North Wales services. The downside of this arrangement was that whilst the Class 390 Pendolino sets are longer and have the added advantage of running off OHLE south of Crewe, coupling and uncoupling at Crewe added to the journey time. From December 2008, all North Wales Coast services were operated by Super Voyagers except for one Saturday service formed of a Class 57/3 and Class 390 Pendolino set. This too was converted to Voyager operation in November 2012. The 57/3's were for Thunderbirds duties so Virgin Trains named the fleet after characters from Thunderbirds. While intended for Virgin's West Coast franchise they were used to haul failed Virgin CrossCountry Class 220 Voyagers from as far as Aberdeen, Eastleigh and Plymouth on occasions. After the completion of the West Coast Main Line upgrade in 2008, Virgin's requirement for Class 57/3s decreased. The sixteen strong fleet found other work with Arriva Trains Wales and Colas Rail. In September 2010, six were placed in store at Eastleigh Works before being returned to Porterbrook and leased to Network Rail in September 2011. With the Arriva Trains Wales contract finishing, a further three were returned to Porterbrook and leased to Direct Rail Services in April 2012. In December 2012, the remaining seven were returned with three being leased to Direct Rail Services and the remaining four sold to West Coast Railway Company. ↑ "Our new Great Western franchise" (PDF) (pdf). First Great Western. Retrieved 20 September 2015. 1 2 FGW honours 'GWR 175' - Railway Herald. Page 3. 28 June 2010. Issue 228. Retrieved 2011-08-05. ↑ "Taunton Trains Loco-Hauled Info". Taunton Trains. 27 April 2011. ↑ Virgin bids farewell to six Class 57/3s - Railway Herald. Page 3. 2011-08-29. Issue 281. Retrieved 2011-09-01. Dunn, Pip (5–18 November 1997). "£13m rebuild for Freightliner '47s'". RAIL. No. 317. EMAP Apex Publications. pp. 8–9. ISSN 0953-4563. OCLC 49953699. "GM engine fitted to Freightliner's new Class 57 at Brush Works". RAIL. No. 327. EMAP Apex Publications. 25 March – 7 April 1998. p. 8. ISSN 0953-4563. OCLC 49953699. "Freightliner's Brush/GM Class 57 goes to work!". RAIL. No. 336. EMAP Apex Publications. 29 July – 11 August 1998. p. 10. ISSN 0953-4563. OCLC 49953699. "Freightliner's Class 57 moves to Felixstowe for tests". RAIL. No. 340. EMAP Apex Publications. 23 September – 6 October 1998. p. 16. ISSN 0953-4563. OCLC 49953699. Holley, Mel (21 October – 3 November 1998). 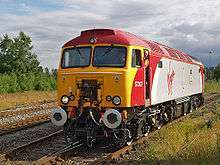 "Freightliner to order 24 more Brush Class 57s". RAIL. No. 342. EMAP Apex Publications. p. 6. ISSN 0953-4563. OCLC 49953699. "57002 ready to go and the rest are not far behind". RAIL. No. 344. EMAP Apex Publications. 18 November – 1 December 1998. p. 45. ISSN 0953-4563. OCLC 49953699.